Ora is using Smore newsletters to spread the word online. Want to strengthen your technology teaching muscles? Find out about strategies, tools, and resources you can use by visiting the iteach Lounge (EDU252) March 13th between 10:00 AM and 1:00 PM. 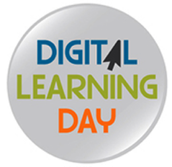 How Can You Celebrate Digital Learning Day? The Instructional Technology Student Association at the University of South Florida was established to promote a sense of community and intellectual exchange amongst students, faculty, alumni and professionals in Instructional Technology.